We provide flexible storage solutions to meet your needs. Now you can have storage where you need it, when you need it, and for as long as you need it. 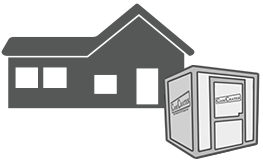 Cook Crates combines secure storage containers with competitive pricing and the unbeatable customer service you’ve come to expect from the Cook name. We can deliver your crate anywhere within 30 miles of our main storage facility, the perfect answer for all local moves. Or keep the crate on your property during remodels, the disaster recovery process or any time you need extra or seasonal on-site storage. Or let us keep your crate in our secure and convenient off-site storage facility. With durable, secure storage crates built from our high quality materials you know your stuff is safe. Cook Crates are the best short-term storage or moving solution for individuals and businesses with flexible rental terms and low monthly fees.